platform bed to fantastic fitness equipment to cookware! On Monday, September 27th, I received an email from Jocelyn at csnstores.com Promotions Department about doing a giveaway or product review. She said she had visited my blog and liked the looks of it. HOW COOL IS THAT! I am so new to blogging, that I was like really? ME? you want me to do something with csnstores.com ???!!!! So I sent back a reply telling her that I only had 7 followers, and probably wouldn't get much response, so I chose to do a product review. She told me to go check out some of their sites and chose an item to review. Well I picked out the Bayou Classic 4Qt. Dutchoven. I guess you know what is important to me?..... FOOD! 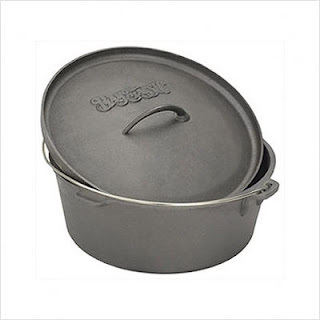 ﻿The Hubby does alot of cooking on the grill and I thought this might be perfect for the veggies and one pot dishes. So I asked him what he thought and he said "heck yeah get that"! So now I wait for my new Bayou Classic 4Qt. Dutchoven to arrive. This is too cool. 'Course now you gotta cook!